Ken, I agree….Gomer Pyle was a great show. Only problem is it is hard to find on TV anywhere today. The networks used to show it at 3 or 4 in the morning, but now can’t find it anywhere. Can’t even find it on Netflix now. Sgt. Carter cracked me up on that show. Gomer drove him to distraction, with Gomer trying so hard to impress Sgt. Carter, but failed miserably. Andrew, do you get a channel that’s known as MeTV? On this particular channel, Gomer Pyle, USMC is ran every morning at 5 a.m. and I know it’s early but if you have access to a DVR you can record it to watch later. I have one–it came with my cable, and I am not sure but that may be the only way you can have a DVR (but I am not 100% sure of that). Also you could record it if you get that channel (or any retro channel like it) and have a VCR. It may be worth looking into. Are you sure that there aren’t any episodes uploaded to YouTube? I haven’t looked yet, but there should be since there really are so many fans. I have even heard that there are a lot of fans worldwide!! It never hurts to call as I did; it was probably about twenty years ago that I had written and called (once each) to Chicago’s WGN which had just taken it off, wouldn’t you know, right after I got cable and just after I got to see only a couple of episodes. For some reason they did bring it back on, much to my delight. (I was probably not the only one who asked.) Well, good luck. I am a huge fan. I just love Gomer and Sgt. Carter, Bunny and LouAnn Poovey, Boyle and Duke Slater, all of the characters!! 😀 Great shows like this are hard to find and it doesn’t seem to be getting any easier, either. All the best for you finding the show, Alexia. We only get ME-TV if our satellite TV isn’t working. Thanks for mentioning that Gomer Pyle can be watched on ME TV. Gomer Pyle needs to be seen by those who never saw it in the past. You can catch Gomer Pyle USMC on YouTube………..
Kathy, Thanks for the info on Gomer Pyle USMC. I’m watching it right now! METV!! I salute METV for showing the Gomer Pyle shows. Great way to watch the shows…on You tube. Gunsmoke season 7 ep.3 Frank Sutton. Appears. Guess he didn’t have his crewcut on Gunsmoke. Would have liked to have seen that episode. Thanks for sharing. Glad you liked Jim Nabors so much along with Sgt. Carter and Roy Stuart who played Corporal Boyle. Sadly, Stuart died on Christmas Day of 2005 at the age of 78. Jim Nabors is now 84. It is almost impossible to find Gomer Pyle on TV today. MeTv has been airing “Gomer Pyle, USMC” for a couple years now at 9pm EST. I watch it every chance I get since I grew up watching reruns the show on channel 45 in Baltimore. They played all the classics back then like Gomer Pyle, Get Smart, Hogan’s Hero’s, Lost in Space, Star Trek, Dark.Shadows, etc. Good to know Gomer Pyle is being shown on MeTV. Used to only find Gomer Pyle about 4 AM on another channel. YouTube to the Rescue. Since discovering the lack of Gomer Pyle reruns on TV, I indulge my Pyle addiction by watching it on YouTube. Thank you for the update about Gomer Pyle being shown on You Tube. John, Thanks for sharing the info about Gomer Pyle being on CBS Digital Antenna channel. That show was a classic and good to know we can see it again now. Just bought Gomer Pyle on Amazon for $ 20 some dollars, one of the best shows ever. Frank, Enjoy the shows. It was almost like Gomer Pyle was being hid when it went into syndication. It used to come on one station about 4:30 in the morning. Wish we had DVR service back then, so we could have recorded them. Thanks for the info…may be the only way to watch the shows….and can watch them whenever you want by owning them. Gomer’s all over YouTube, complete episodes. Watch on your computer, or get a Roku (which connects to your television like cable) and watch episodes on your TV! Thanks for posting the info on where to watch Gomer Pyle. Don’t know why Gomer Pyle has been hidden in the early morning hours. Can still record it for later. Wish we still had ME TV. Thanks for the info on Gomer Pyle. We have DirecTV so I need to check and see if we have Channel 20 in our package. John, Thank you for the info. Hope that DirecTV starts showing Gettv. I loved Louann Poovie. It’s hard to find actors/actresses with a southern accent,let alone two on the same show. They make a lot of them lose their southern accent before they can get gigs in Hollywood. Elizabeth MacRae played Lou Ann and will be 80 years old on Feb.22. She was in her first TV show in 1951 in Search For Tomorrow. Her last show was in 1984, when she was in an episode of Guiding Light, so hasn’t been on TV or in movies for 32 years. Amazon has the complete series on DVD (24 discs) for $40. Andrew Godfrey, I see now that I sent a message that wasn’t really necessary. Really, I have a weird habit of scanning through things a bit too quickly and usually only stop just when something jumps out at me. Hence my prior message that I’d just wrote to you. I know now that it’s all redundant. I realized that when I went to take a look at what I have just finished posting (to reread, hoping I made no errors) and THEN I find myself here reading all these great messages which means mine is only redundant. I know I should have read them first, but I just saw that certain particular one of yours (that jumped out at me) and thought maybe I could help you. Well, I still hope you’ve found and are getting to see Gomer episodes, somewhere, now!! I know how much I sure do enjoy watching it, myself, and it sounds like you do, too. Take care!!! I appreciate your post, so don’t worry about being redundant, even though I don’t think your post was redundant. I’m watching the show now. It’s the one where Gomer gets his private fairest class stripe. Classic USA comedy gold. Great that you are seeing the shows. I don’t understand why Gomer Pyle shows aren’t shown at better hours. It is almost like they are trying to hide the shows. I agree with Tim that Sgt. Carter made the show even more than Gomer Pyle. The show did so well in the ratings, that the Jack Benny show was canceled. Wish we could see Gomer somewhere besides You Tube, since we have satellite internet and it starts and stops all during the show, since we live out in the country. Watching it now…..Greatest thing EVER!!!!! Two words….Amazon Firestick!!!!! EVERY EPISODE AT YOUR FINGERTIPS!!!!! Great that you found a way to watch the shows. Hated Gomer pyle as a young man love it as a adult. Frank Sutton was a real life hero in WW2. Liked Sutton as a actor, admire him as a person. Frank Sutton had a very impressive career with the Army. I knew all along he had military training and I thought maybe the Marine Corps. His uniform and the way he wore it showed that he had military training. If you ever saw him in a acting role other than G.P. he was a good actor. Frank Sutton was perfectly cast as Sgt. Carter. One of my favorite shows ever, but networks seemed to hide it in early morning hours after it went off network TV. I found the complete Gomer pyle series at Walmart on DVD for 35.00. MIchael, Thank you for this information. A lot of Gomer Pyle fans will be glad to know this. Gomer Pyle has been shown all day and night today on the Decades Channel. Wish we had Decades channel here. Great that they are showing the Gomer Pyle shows all day. The scenes with Gomer and Sgt. Carter are all classics. Sad that actor Frank Sutton, who played Sgt. Carter died 43 years ago in 1974. Gomer Pyle is shown on ME TV from 8:00-9:30 P.M Monday-Friday. I really like watching it among most shows of that time. Thanks for the info on the time to watch Gomer Pyle. Thank you for your service and for the info. I saw that Gunsmoke episode and Frank didn’t do much in it. He was great in Pyle though. Gomer Pyle is currently being shown on METV at 9:00PM Eastern Time. I still love the show to this day. It is well written and acted. Frank Sutton is an absolute riot, and always find myself laughing during each episode. Perhaps Frank Sutton died early from being a heavy smoker which you could hear in his voice on the show. Gomer is always honest and does what is in his heart. Gomer Pyle should be on Netflix. 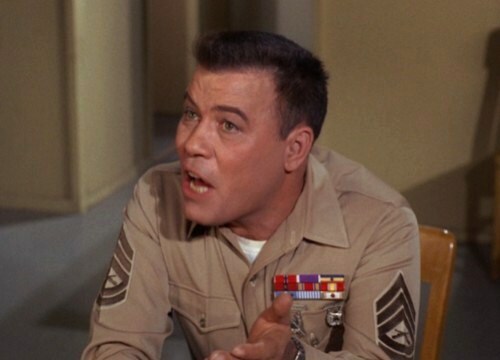 I watched this show regularly and liked it as a kid, but never realized how hilarious Frank Sutton was in his role as Sgt Carter. Jim Nabors was great but Sutton was even better, just lol funny much of the time. He should have gotten an Emmy imo. I don’t see how some of the other actors kept from laughing those two were so funny especially Sutton as Carter. Great show to watch when you need something to cheer you up! I agree. Sutton was perfectly cast as Sgt. Carter. That role was made for him. I love Gomer Pyle. It’s so sad he is no longer with us. He was so handsome and loveable.